What Is Black Rice, and Where Did It Come From? A new study examines the genome to try to track this sinister-sounding rice back to its source. Black rice is a particularly odd duck; its deep, dark color, which is something like a purplish black, is a rarity in the food world. Black rice comes in a few different forms; often it’s a glutinous variety, but there are black jasmine rice varieties as well. That dark color is due to an excess of anthocyanin, a powerful antioxidant that’s the culprit for most darkly colored plants. Dark purple eggplant? Anthocyanin. Same with blueberries, aÁ§aÁ­ berries, and concord grapes, along with the colored versions of normally paler plants like purple cauliflower, purple corn, and blood oranges. Black rice has a spectacularly high level of anthocyanin, which might be why it’s revered in, for example, China as an extremely healthy food. It also is fairly tricky to grow, at least in terms of yield, which is often as low as 10 percent of other rice varieties. It’s occasionally called “emperor’s rice” or “forbidden rice” for that very reason: Oral history suggests that only the richest of the rich were able to afford the delicacy. 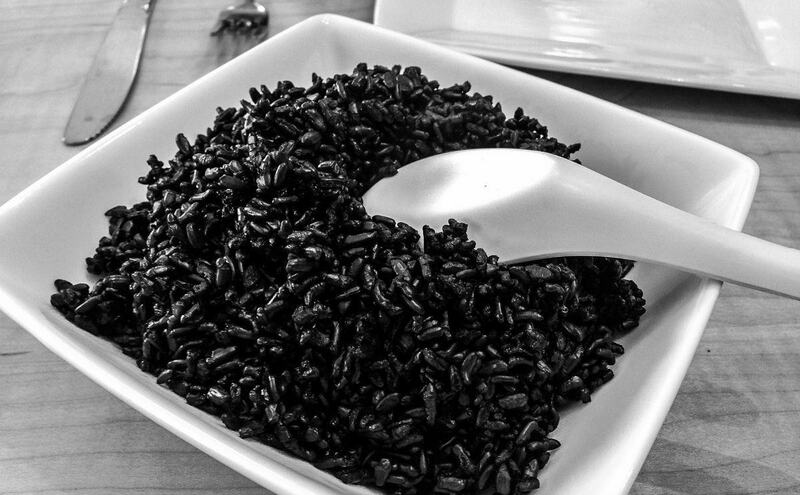 A new study, led by Japanese researchers, analyzed the genome of 21 black rice varieties (as well as some similar white and red rice types, for comparison) to try to find out more about how some rice ended up black, and why. They found that black rice all originates from Japanese rice, and found the specific gene that has gone haywire in black rice, triggering the plant to produce large amounts of anthocyanin. The theory is now that black rice is naturally occurring, but only as a mutation, and that it was kept and made into a reliable source by humans crossbreeding black rice mutants to produce more. Black rice can be found in most larger gourmet supermarkets these days: Whole Foods and Trader Joe’s are pretty likely to stock it. And it’s delicious; it has a sort of earthy, nutty flavor like a more intense brown rice, but the texture is closer to white, especially in the glutinous varieties. It’ll also turn the water you cook it in a deep, lovely purple, which is fun. Go try it! those in Bangladesh from China . I great full to you if give advice . Good article but why do you say, “sinister-sounding”? Is it sinister b/c it’s black? Quite the contrary it sounds healthy, rich, nutrient dense, powerful. ETC. Just because the color of a rice (or any food or thing for that matter) is black does not mean you should call it a sinister-sounding rice. Everything that is naturally the color black does not mean it is bad or sinister-sounding just as everything that is the natural color white does not make it favorable or good.